For more than forty years, Carolyn Bolger Payne has shared her remarkable voice and spirit with audiences around the world. 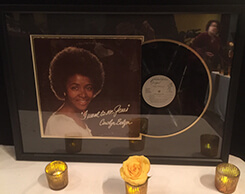 But this weekend, friends and family sang her praises, as the city’s Mayor and members of the Philadelphia Clef Club of Jazz and Performing Arts proudly presented Carolyn with a Lifetime Achievement Award for her contributions to music and the arts. You can click here to watch Carolyn sing, “Go Tell it on the Mountain,” at this weekend’s event. The following citation accompanied Carolyn’s Lifetime Achievement Award. Carolyn Bolger Payne is a tremendous and unique talent from our City of Brotherly Love and Sisterly Affection. She has been singing gospel music professionally for the past forty years, and through her performances at many churches, colleges, conferences and concert halls in the U.S. and Western Europe, she has spread her faith and courage to youth, and given back to the communities of her city. Her many performances have earned her much acclaim and recognition including the Best of Philadelphia Music Award. She has appeared on many telecasts including the PBS production “The Sound of Philadelphia,” and the formerly televised “Time of Deliverance,” weekly TV special. She has performed and recorded with the James Cleveland Workshop Choir, the Thomas A. Dorsey Workshop Choir, the Philadelphia Gospel Seminar Choir in Paris, the Philadelphia Ambassadors, the Smithsonian Institute’s Folklore Wade in the Water CD and the Boston Philanthropic Orchestra. She gained much attention from her album, “I Want to See Jesus,” which was mostly recorded live in the City of Philadelphia. On Saturday, March 23, 2019, Mrs. Payne will receive a Lifetime Achievement Award from the Philadelphia Clef Club of Jazz and Performing Arts during her golden 70th birthday celebration. It is fitting and appropriate therefore that the City of Philadelphia officially recognizes Carolyn Bolger Payne and commends her for her long and successful musical career which has resulted in a large and adoring following. I congratulate you on this prestigious award and wish you and the audience a most memorable and enjoyable evening. On behalf of Oxford Communications, congratulations on your Lifetime Achievement Award and thank you Carolyn for bringing your brilliant warmth and spirit to our workplace.